Aaron started his career at Ilkeston Town, before making a number of appearances for Scunthorpe United reserves. He joined them on a non-contract basis in November 2002, but his stay at the Iron did not go well and he was released by manager Brian Laws blaming a poor attitude. 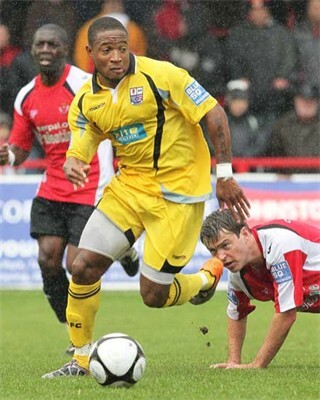 He started the following season with Nuneaton Borough, but re-joined Ilkeston Town after only a few games. 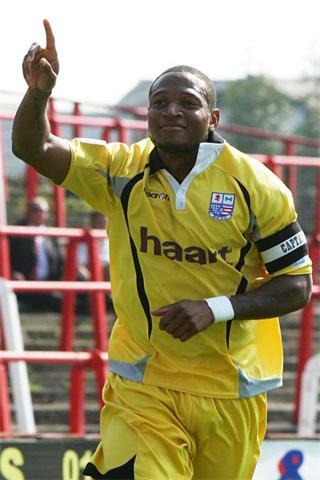 On 15 July 2004, he joined rivals Gresley Rovers where he became a prolific goalscorer, and in 127 games over a three year period, scored some 80 goals, picking up numerous awards along the way. He very nearly signed for Diamonds in June 2006, having a trial period under manager Paul Hart, and playing in some of the pre-season friendlies, but he returned to Gresley Rovers. In January 2007, he joined Conference side Grays Athletic, managed by Justin Edinburgh, spending 1½ seasons at the club. In August 2008, he moved to Mansfield Town, where he spent the following season, before joining Diamonds on 30 June 2009. He made his Diamonds debut on 8 August 2009, missing the chance to score on his debut from the penalty spot as Diamonds lost 0-2 against Salisbury City at Nene Park. 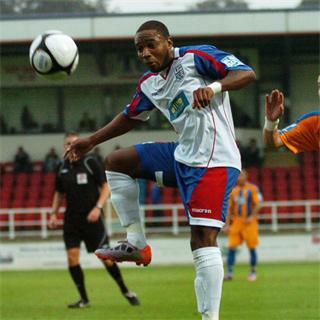 He scored his debut goal for the club two weeks later against Forest Green Rovers. During the 2009/10 season Aaron scored a total of 15 goals in all competitions, which made him joint-top scorer for the club in that category. After a successful season as Diamonds’ captain in 2010/2011 where again, he was top goal-scorer, he also picked up the Sponsors’ Player of the Season award, the Diamond Minors Player of the Season award and the Supporters’ Player of the Season awards. Following uncertainty at Diamonds during the summer of 2011, he was released and joined Luton Town on 6 June 2011 on a two-year deal. After just one season with the Hatters however, he was re-united with former Diamonds Manager Justin Edinburgh at Newport County and played in a pre-season friendly against Bristol Rovers, before signing officially for the club on 25 July 2012. His 19 goals in 41 appearances guided the Welsh side to promotion into the Football League via the Wembley Play-Off Final and he was rewarded on 20 May 2013, with a two year contract. He was released by the Welsh Club at the end of his contract in 2015, and he joined Forest Green Rovers prior to the start of the 2015-16 season. In February 2016 he joined Stevenage after a short loan spell, before moving to Kettering Town in September 2016. His Wikipedia entry is here.